So last week Joel Smith from the Pacific Northwest Inlander emailed me to see if he could interview me about how I started bike commuting again last year. He was working on an article promoting next week’s Bike To Work Week here in Spokane and I think John Speare had pointed him my way as an example of someone who had caught the bike commuting bug over the last year or so. 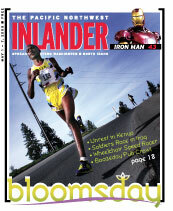 I ended up talking to Joel on the phone for about 20 minutes last Friday and the article, appropriately titled High Gear, is now out in this week’s Inlander. I’m really excited to participate and see how Bike To Work Week goes in general next week. It sounds like there are going to be over 600 participants around Spokane which is really amazing. I’ve already been seeing a lot more riders out and about this spring and my next door neighbor has recently started riding into work as well. Watching (and being a small part of) all the growing bicycling momentum building here in Spokane is pretty cool.